Welcome, all, to a super-sized edition of RADICAL RETRO TURTLE TOY TALK! And we surely had better “super-size” it, because this week’s featured character takes the term ‘thinking with your stomach’ to a whole new level. Forget Triple H, we’re going to look at the various incarnations of the original cerebral assassin, the big, bad brain called Krang! If you are even a casual Teenage Mutant Ninja Turtles fan, it is next to impossible for you to not know who Krang is. Krang specifically co-starred in the 1987 cartoon, the Archie comic, and a lot of the video games. While he himself was not originally a character in the old comic, the Utroms, who are the alien race upon which Krang’s appearance was based, were. 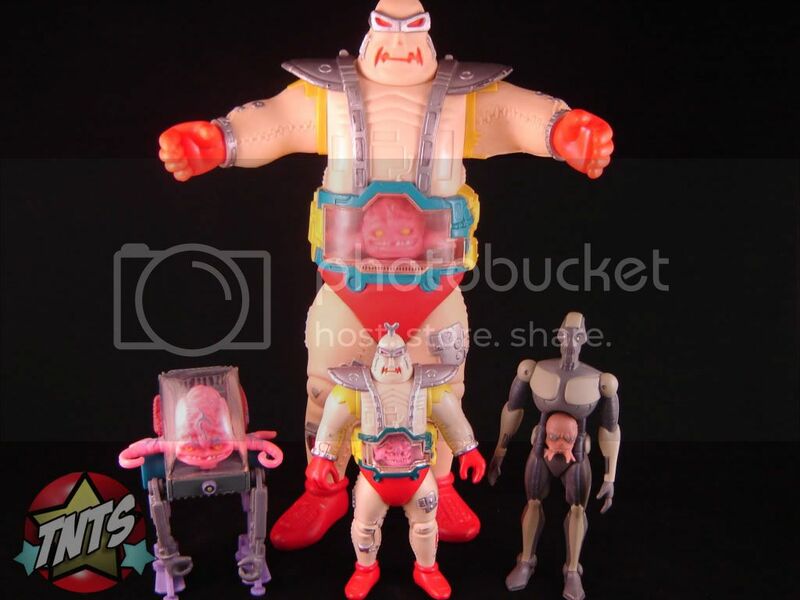 The Utroms also appeared in the more original comic accurate 2003 cartoon, one episode of which had an Utrom named Krang as a nod to the 1980s character. 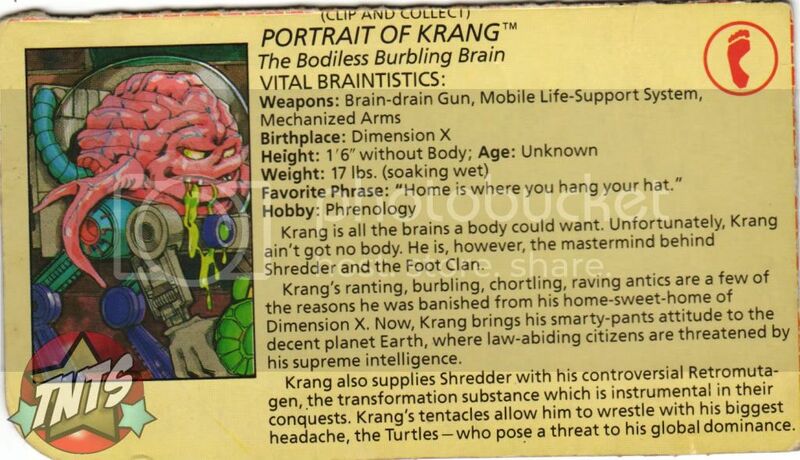 Krang’s backstory is that of an ousted Dimension X dictator who was exiled away to Earth. On Earth, he formed an uneasy alliance with Shredder and the Foot Clan, and shared the use of his titanic Technodrome. In the 1987 cartoon, we learn that Krang did once have a humanoid body that he was a physical part of, although it is never explained exactly how he lost it. Now without a body, Krang utilizes various mechanical modes of transportation. 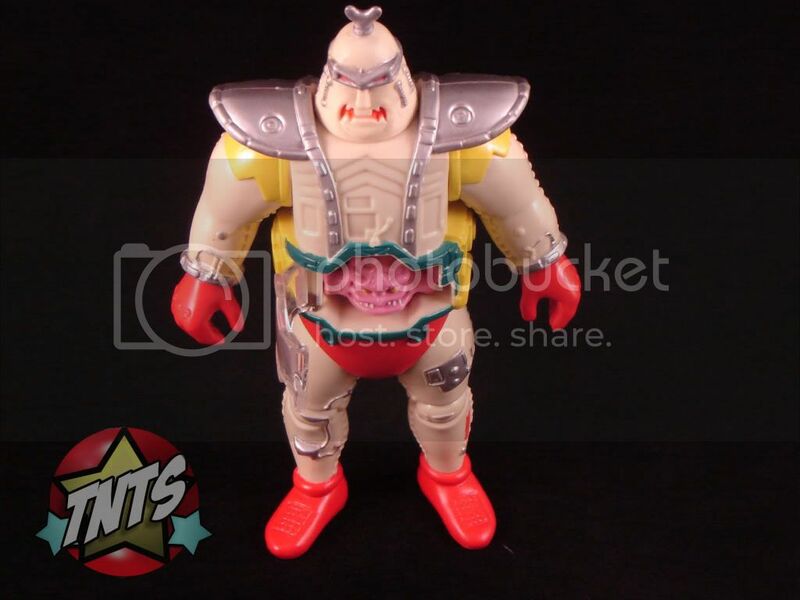 In 1989, Playmates presented us with our first Krang figure. Krang himself is barely more than an inch tall and has two swiveling tentacles that only serve for posing, as he can’t hold really anything with them. To compensate for being a small, three-piece, plastic finger puppet, Krang comes with a Mobile Life-Support System to get around in. 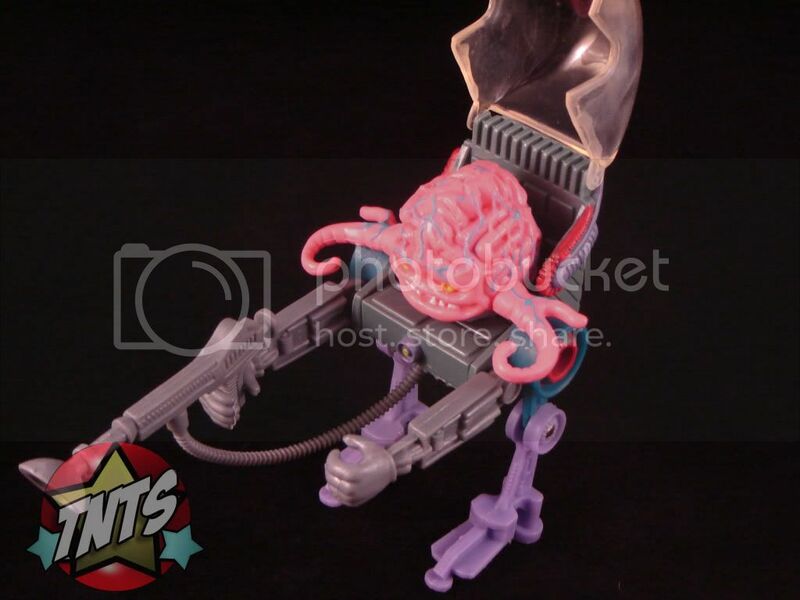 The System has two swiveling legs with jointed knees, as well as an opening/closing clear plastic hatch with holes in either side for Krang’s tentacles. Attachable to the Mobile Life-Support System are two Mechanized Arms which can also swivel on the System’s pegs for more posing ability. The Mechanized Arms can also wield the baleful Brain-drain Gun, siphoning the sensibilities out of the heads of our heroes and into the Brain-powered Tanks on the back of Krang’s Mobile Life-Support System. A plastic hose piece connects to a peg on the Brain-drain Gun and into a hole on the underside of the System. 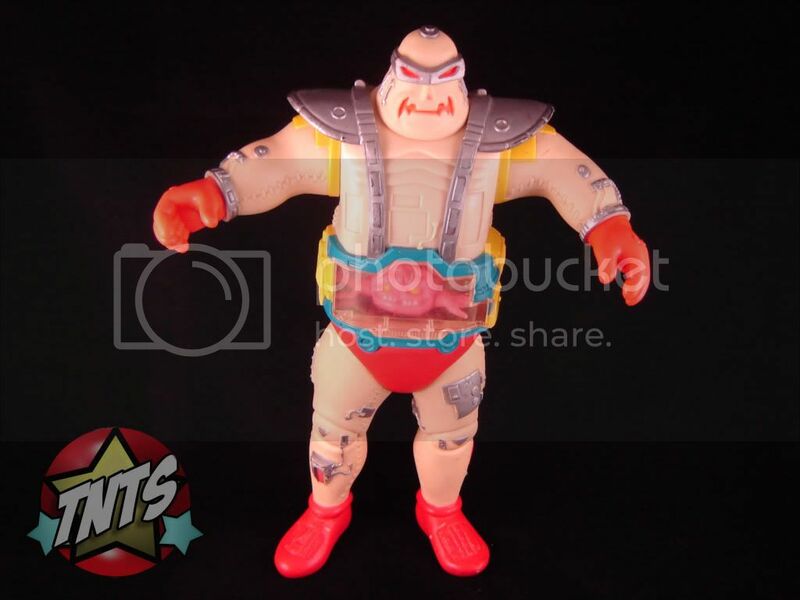 The legacy of the nasty noodle named Krang did not end with one figure. In 1992, one my personal favorite toys of all time was released. Appearing almost identically to his animated counterpart and standing at an enormous eleven inches tall, I give you Krang’s Android Body! This titan totally towers over the Turtles, and can even victimize vehicles with his sheer size. As you can see, my Krang’s Android Body has seen better days. Originally, the figure came with applicable decals highlighting his Techno-electro Circuitry. Mine is also unfortunately missing the Rotating Brainwave Radar that goes on top of his head. Despite any of that, though, Krang’s Android Body is still a lot of fun to play with. He’s got just as much articulation as most of the standard sized figures from the original toy line, which allows for an adequate amount of battle stances and playability. The Krang figure that comes with the Android Body is the exact same figure as the 1989 release, minus a bit of detail. 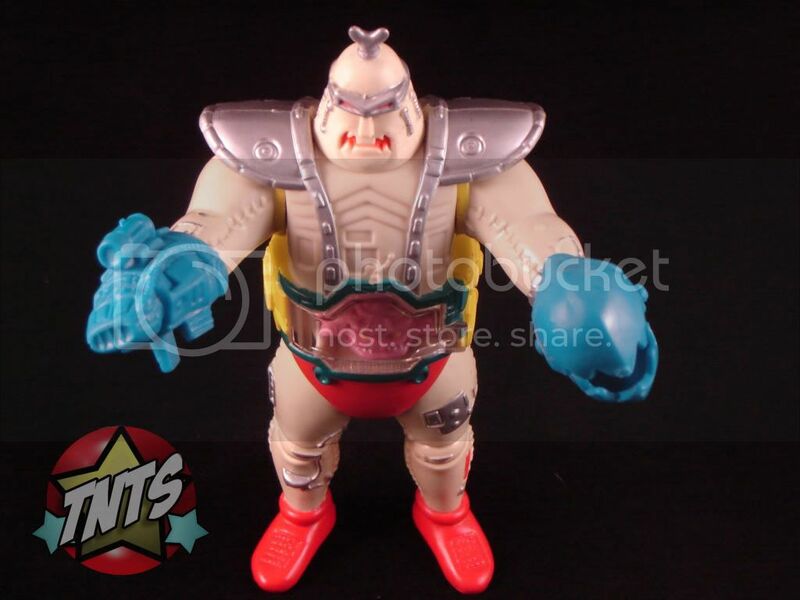 Most notably, the earlier Krang had blue vein highlights, while the later one was, with the exception of the white teeth and yellow eyes, solid pink. 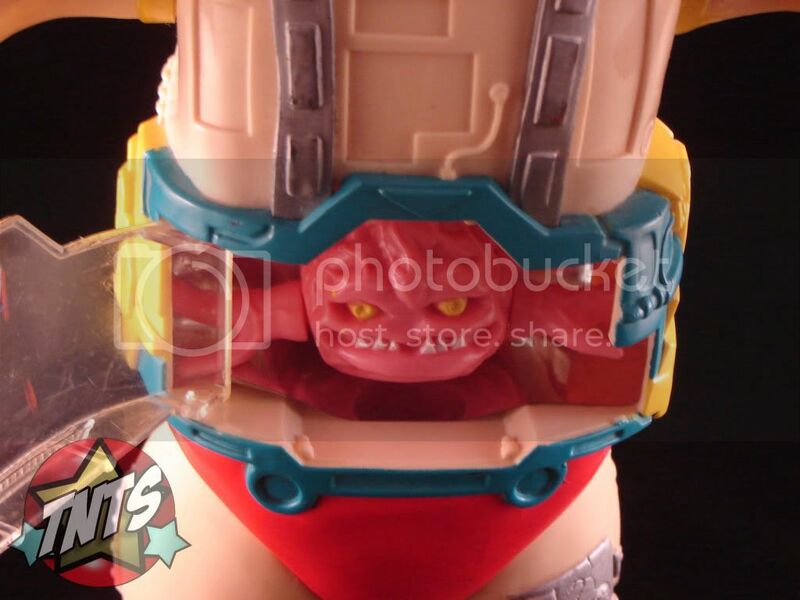 Like in the 1987 TV show, Krang fits comfortably into a compartment in the abdomen of the Android Body. Once inside, Krang is protected by a clear plastic plate, which he ogles out of as he trounces and tramples the Turtles! 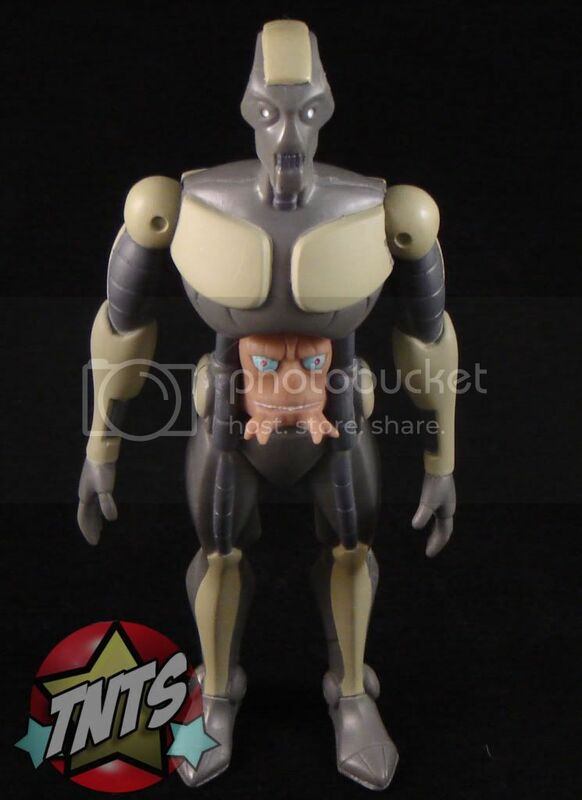 Two years later in 1994, Krang’s Android Body returned to toy sections, only in a much smaller size. 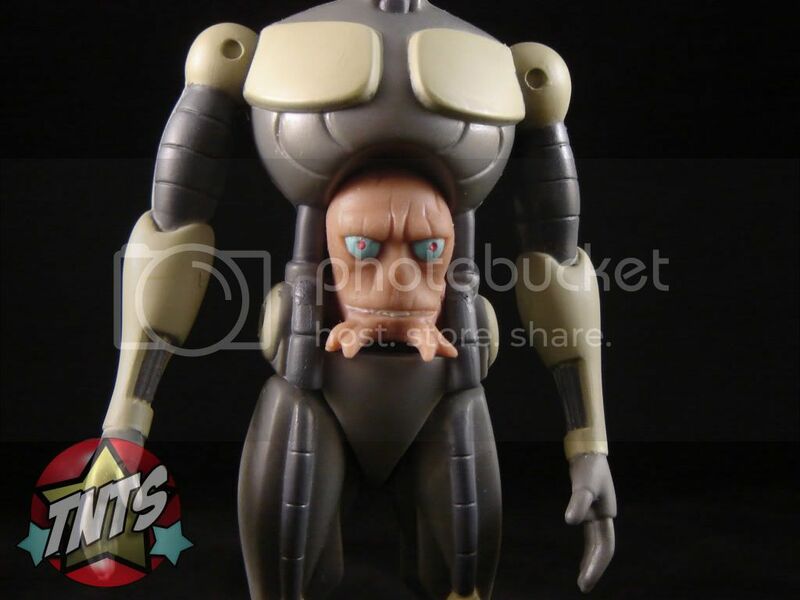 Formatted down to about five inches in height, Krang’s Android Body is almost exactly the same figure as the 1992 release on a smaller scale. He is just as articulate as the 1992 giant, with a hatch in the belly for a more bite-sized brain to fit in. The two figures’ colors are identical, as are most of the specs. One minor physical difference is the positioning of the arms. The 1992 Android’s arms are spread out to intimidate opponents, while the arms of the smaller 1994 counterpart hang down in a less menacing manner. Also, the Krang with the 1994 Android is obviously much smaller than his larger predecessors, and is a solid pink piece of plastic with eye and tooth highlights and no articulation. The 1994 Krang’s Android Body’s accessories are a major part of what makes this smaller figure smack of awesomeness. 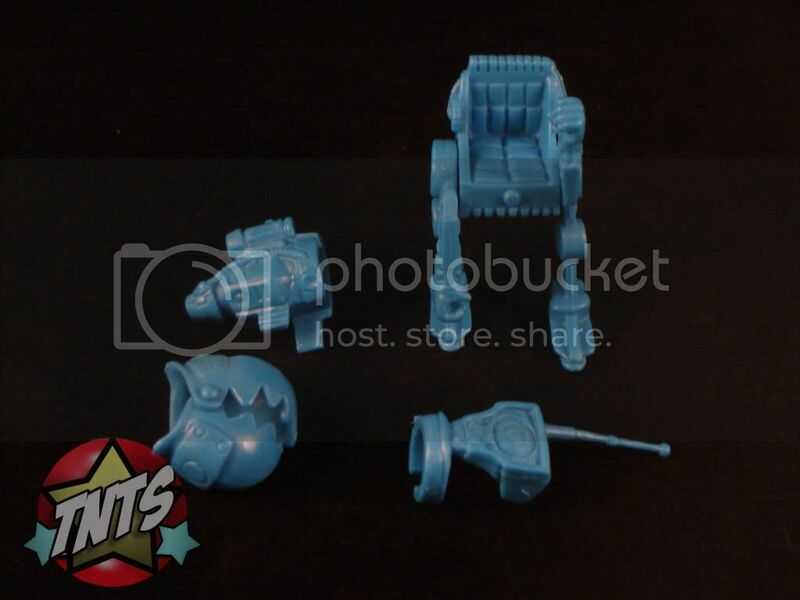 Fitting over his fists are the solid blue Attachable Cranium Claw, Dimensional Communicator, and Android Lazer Blaster. When these items hook onto his hands, they provide the appearance that the Android’s hands have actually transformed into these items as has been seen in the old cartoon. My favorite of this figure’s accessories, though, is the Mutant Mobile Walker, which is a wicked cool throwback to the 1989 Krang figure. The Walker is a scaled down Mobile Life-Support System, tailored to transport this tiny version of Krang. 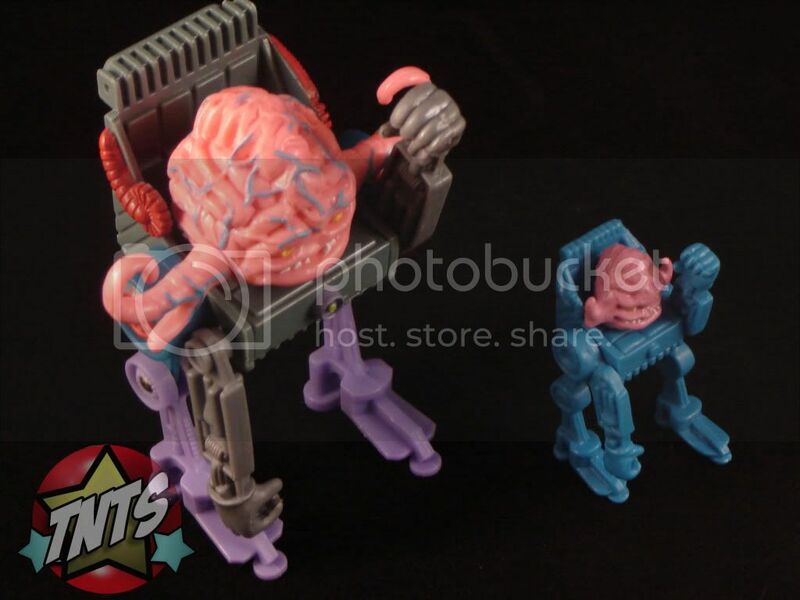 Aside from being solid blue with no articulation, hatch, or gun, the Mutant Mobile Walker is arguably an entire extra figure thrown in with the little Krang’s Android Body. Simply too freaking rad! Jumping forward to 2004, interestingly enough, takes us back nearly twenty years. As we know, the 2003 Teenage Mutant Ninja Turtles animated series was a lot more concurrent with the original comic. 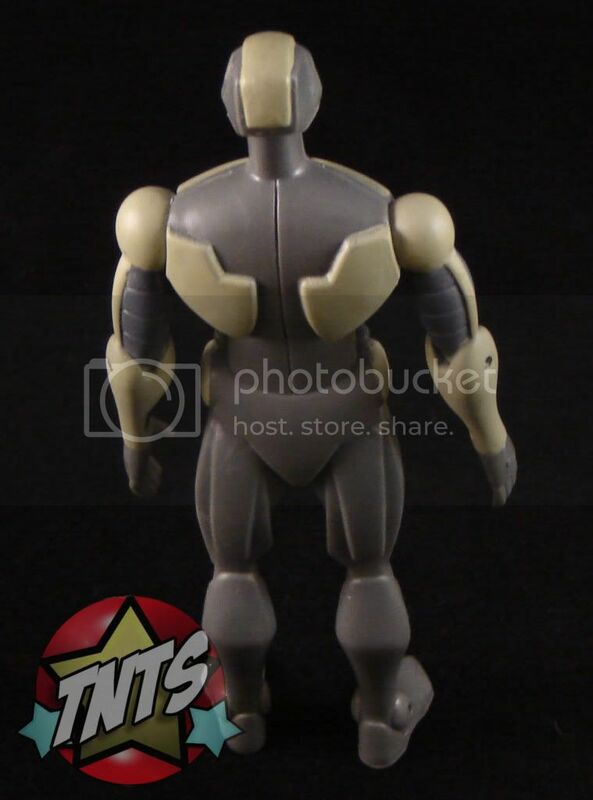 With that said, the 2003 TMNT gave us an Utrom figure rather than Krang. Unlike Krang, the Utroms, with a few rare exceptions like Ch’rell, are a peaceful race of brain-like aliens. In fact, the Utroms are the ones responsible for the creation of the very mutagen that transformed Splinter and the Turtles into who we know and love. 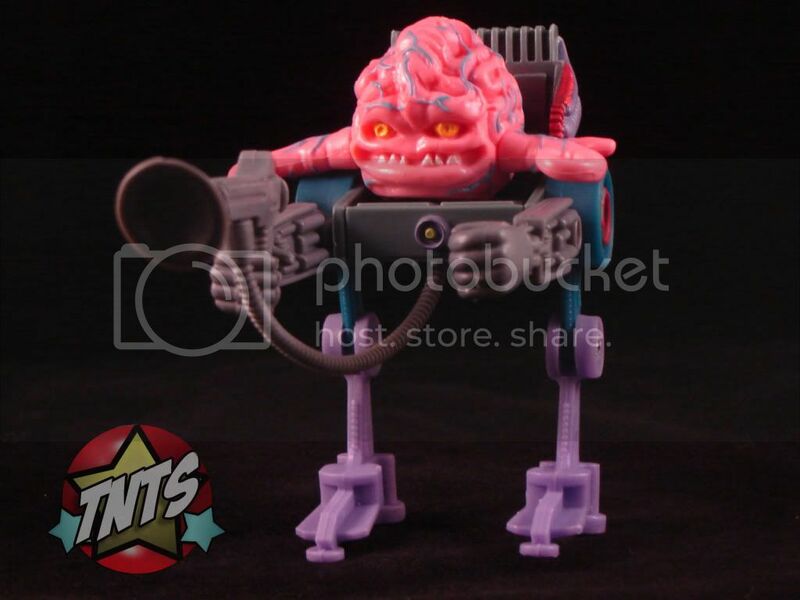 As mentioned earlier, there is an Utrom named Krang who had a cameo in the 2003 cartoon, but it was really only a salute to the 1987 series. The Utrom exoskeleton figure is pretty simple in design. 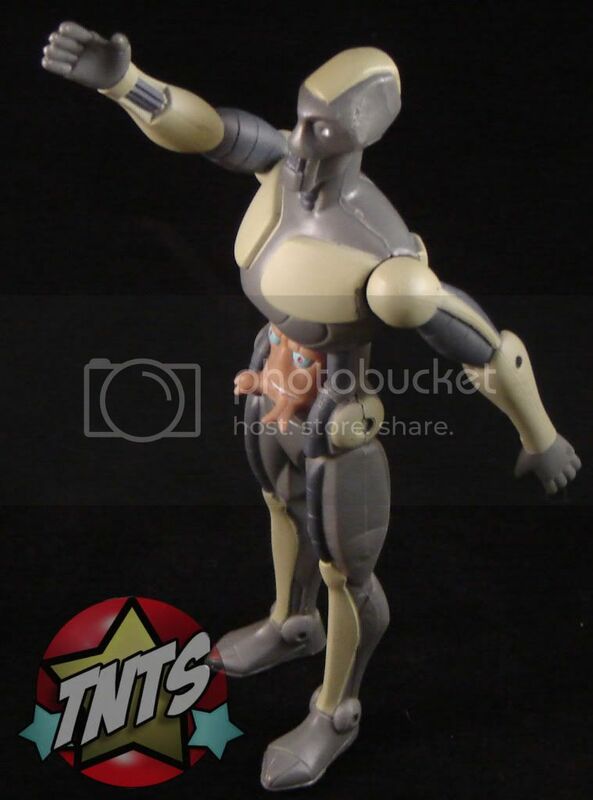 Its colors are merely two shades of metallic gray and its only five points of articulation are its neck, shoulders, and hips. The sweetness is all in the cavity in the exoskeleton’s abdomen. 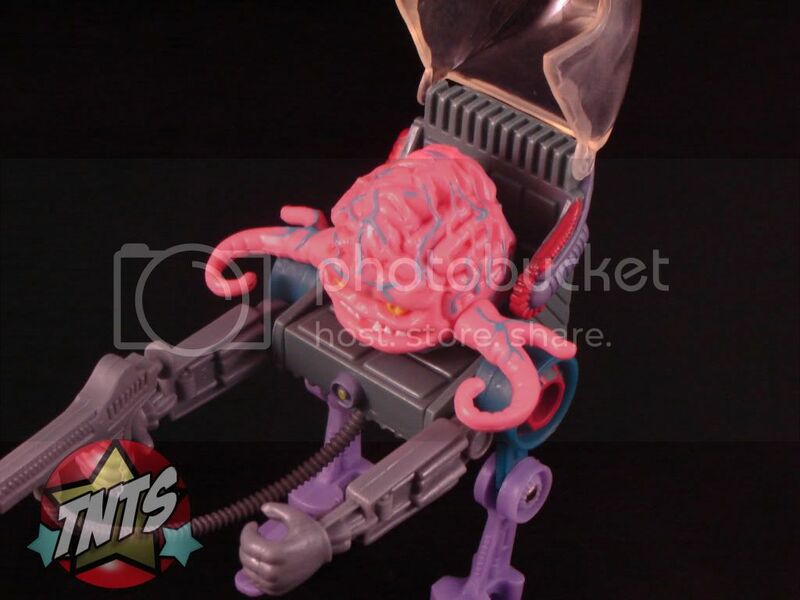 Inside it sits the pink, six-tentacled, blue-eyed Utrom. And when he doesn’t want to ride in his exoskeleton, the Utrom can hop on to his accompanying Utrom Flying Disc, which he fits onto via suction. 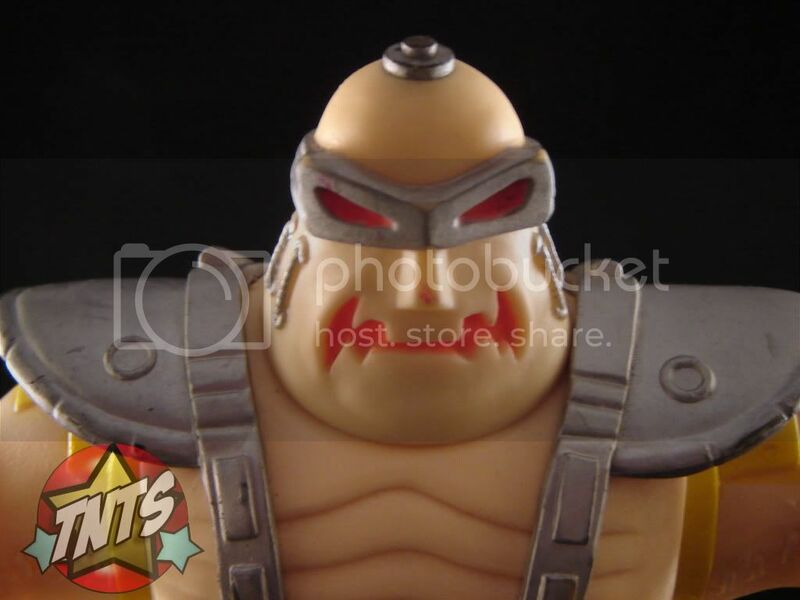 While all of the Krang figures are hard plastic, the Utrom is soft and squishy! He has a hole on his underside, so when you place him on his Disc and smoosh him down, he actually sticks on pretty tightly, which adds to his fun factor when playing, and his safety specs when trying to keep up with parts. 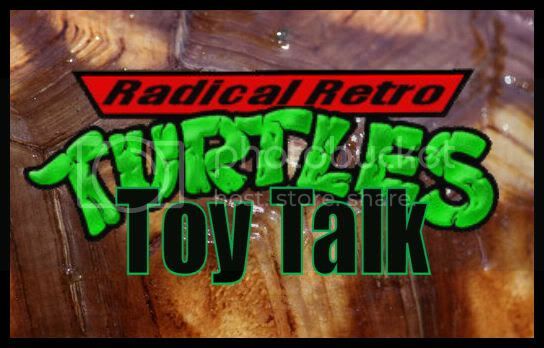 Well, amigos, I hope you managed to hang with me on this elongated installment of RADICAL RETRO TURTLE TOY TALK! 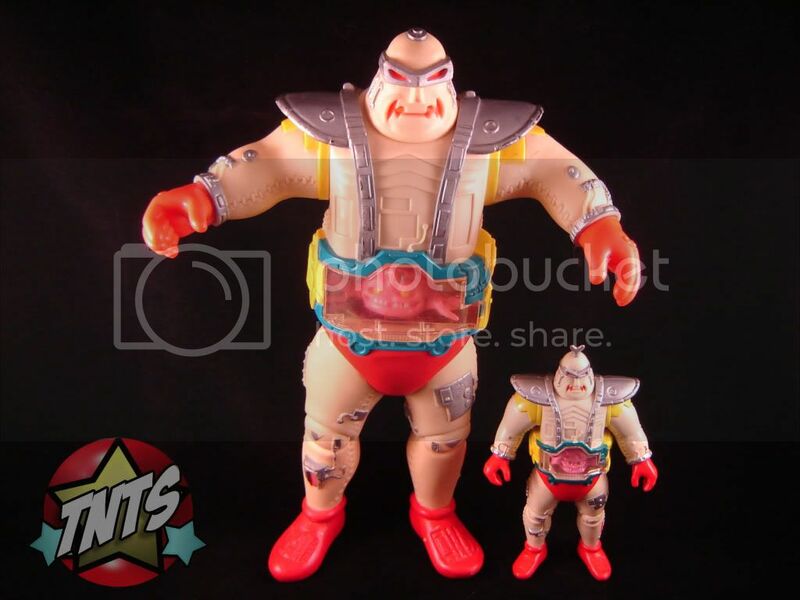 If there is anything you feel like I missed, or anything you would like to add about Krang, the Utrom, or any Turtle-related topic whatsoever, make sure you sign up for the forums at ThatNewToySmell.com right now! That’s where the brain-boys and I will be, and we hope to see you there!